Definition of an Electrolytes: An electrolyte is a substance that ionizes into positive and negative ions when dissolved in an aqueous solution. These free ions in a solution consists of the property of conducting electricity in the aqueous state. The strength of the electrolyte depends on its ability to disassociate and conduct electricity. Strong Electrolyte: A strong electrolyte when dissolved in water forms a solution that is a very good conductor of electricity. This implies that a strong electrolyte is a solute that completely or near to complete dissociates into all its ions in the solution. At the same temperature a solution of strong electrolytes has greater vapor pressure than pure water. Strong electrolytes include strong acids, strong bases and ionic salts. The dissociation of the strong electrolyte occurs in one direction, which implies it is not reversible. The below equation is mentioned in an aqueous state because a strong electrolyte conducts electricity only in an aqueous state. Cations and Anions: The ions can be classified into two types the cations and the anions. The cations are positive changed ions which are formed by the loss of electrons. The anions are negatively changed ions which are formed by gain of electrons. Here is an example showing the disassociation of NaCl in water. This gives rise to two ions the sodium cation and the chloride anion in an aqueous solution. The disassociation is not reversible as NaCl is a strong electrolyte. Weak Electrolyte: The electrolytes in which the solute does not completely dissociate in the solution is called a weak electrolyte. This implies in such solutions there are disassociated ions as well as molecules of the electrolytes. Therefore the weak electrolytes ionize less in aqueous solutions and conduct very less amount of electricity. The Hydrogen cyanide when dissolved in an aqueous solution disassociates partially being a weak electrolyte. The HCN disassociates into a hydrogen cation and a cyanide anion in an aqueous state. The Ammonium hydroxide disassociates into an ammonium cation and a hydroxide anion in an aqueous state. Non-Electrolyte: A substance which when dissolved in water lacks ions due to which there is no disassociation is called Non-electrolyte. A non-electrolyte has no ionization therefore it cannot conduct electricity. Most non-electrolytes are polar or non-polar molecules as they dissolve in water as molecules but do not dissociate as ions. 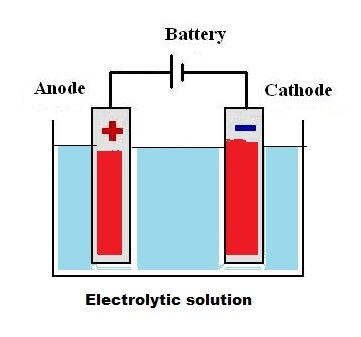 Electrolysis: Electrolysis is the process of passing current through a solution of an electrolyte. In this process of electrolysis the negative and positive ions move towards their respective electrodes. The electrode attracts the ions of the opposite charge towards itself. Electrolytic cell: The ‘Electrolytic cell,’ is where the process of electrolysis is conducted. The electrolytic cell consists of a beaker which is filled with the electrolytic solution. This cell is then connected to two conducting plates called the anode and the cathode. The anode is a positive electrode that extracts electrons from the negatively charged ions which are the anions. The cathode is a negative electrode that provide electrons to a positively charged ions called the cations. These two electrodes are connected to the D.C power supply terminals. The electric current enters through the positive electrode which is the anode passes through the electrolytic solution and leaves through the cathode. The process of oxidation which is the loss of electrons takes place at the anode. The process of reduction which is the gain of electrons takes place at the cathode. What exactly do the electrolytes do? A body cannot function without the electrolytes due to the important role they play in the cells. They regulate the nerve and the muscle function in the body. They help in maintaining stability in the cells and generate energy when required. They control the body hydration, the pH levels in the blood and the blood pressure. They responsible for rebuilding the damages tissues. The calcium (ca2+), Sodium (Na+) and potassium (K+) are required for muscle contractions. The kidneys and other hormones present in the body ensure the electrolyte levels are balanced in the body. Exercise helps in losing the ions such as sodium and potassium and retain the balance. Eating a balance food especially the fresh fruits and vegetables regains the lost sodium and potassium levels in the body.